Did you know that tomorrow is Mole Day? Well, I didn’t, but because I get cced on some emails that are sent by my kids’ teachers, I know now. Whew, almost missed it! Apparently Mole Day was started in 1991 by a high school chemistry teacher from Wisconsin. They are weird in Wisconsin! I don’t know what a mole is — really. I gather it is a unit of measurement used in chemistry. Because my high school counselor advised me to not take chemistry since I was going to be an elementary school teacher, I didn’t take chemistry and therefore didn’t learn about moles. I read the notes and watched the PowerPoint slides that my son’s chemistry teacher has online but I don’t get it. I skimmed the Wikipedia entries about moles and mole day and I don’t get it. Something to do with 1023. And a crown. I’m thinking of rereading Wind in the Willows — after all, it is the year of the Rat so Mole Day 2008 should be Wind in the Willows themed. 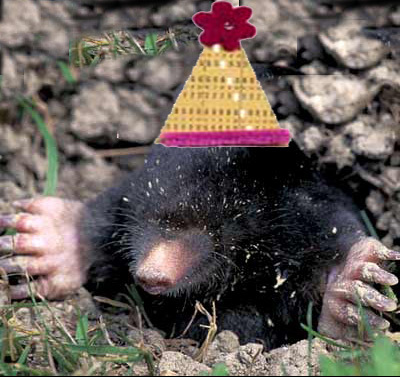 So, how will you celebrate Mole Day? Pingback: Clutch Cargo Lips » How much wood would a woodchuck chuck?